Oxford City Council is working with the Broken Spoke Bike Co-op to give the city’s abandoned bikes a new lease of life for the benefit of the local community. From now on a proportion of the abandoned bikes which are retrieved by the Council from Oxford’s streets will be donated to the Broken Spoke for their Build-a-Bike cycle maintenance programme. Participants on the course will learn how to bring the bikes back to their former glory before riding them away at the end of the course. In partnership with Crisis Skylight Oxford, Broken Spoke have recently used abandoned bikes in order to provide free Build-a-Bike courses for Crisis clients who learn valuable skills and gain confidence through the process of rebuilding the bikes with the additional benefit of owning a bike at the end of the course. Oxford City Council’s dedicated abandoned bikes team collects bikes abandoned in Oxford in order to avoid obstructions on pavements and ensure bike racks are not used inappropriately for long-term storage. 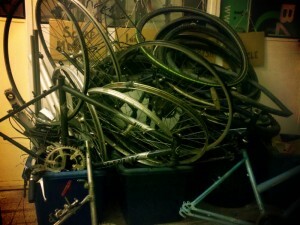 In total 119 abandoned bikes were removed in the last year. The Council seeks not-for-profit organisations to work with to re-use the abandoned bikes and is very pleased to be working in partnership with Broken Spoke to ensure that the bikes are used to provide a community benefit. Councillor John Tanner, Board Member for a Cleaner, Greener Oxford, says: “It is fantastic working in partnership with the Broken Spoke to provide a creative solution to the problem of abandoned bikes in our city.